Excited to try Scuba diving on your next trip? Most of us have read some horror stories about scuba diving before. Plenty of scuba diving scenes in Hollywood movies end in disaster. A certain apprehension is natural. After a bit of “googling” around you feel ensured enough, until you enter the landing phase on your flight. Now your ears start to play up already?! How the heck am I supposed to do it underwater? How to equalize your ears while scuba diving? Well don’t worry! It is very easy and there are plenty of techniques to help you. Us dive instructors have plenty of experience and we can couch you through the mysteries of equalizing. No need to fear pain or ear damage. Why do we have to equalize our ears? Luckily, equalizing is not a difficult skill. Your middle ear is a separated chamber. The middle ear is closed on one side by your ear drum and on the other side by the Eustachian cushion. Equalizing is the constant act to open your Eustachian tubes to allow air to reach equal pressure in your middle ear. Oxygen is absorbed by the tissues in our middle ears, which lowers air pressure. As a result we equalize quite frequently throughout every day. Most people do not notice it, but if you listen out for it you might here a “popping” or “clicking” sound when swallowing or wiggling your jaw. 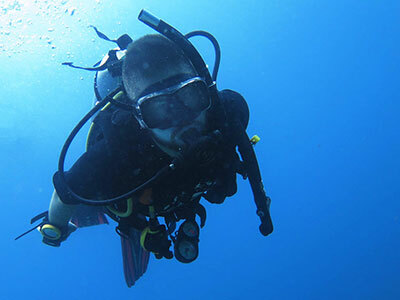 When we dive, we subject our entire body to far greater pressure changes. At a depth of only 10 meters we double our surrounding pressure from 1 bar to 2 bar. Essentially, water is pushing the ear drum in. Density of the air trapped in your middle ear increases and volume decreases. We need to equalize consciously quite frequently in order to avoid barotrauma and permanent injury to our ears when we descend on a dive. Equalizing is mostly passive on our ascents. So, how to equalize your ears while scuba diving? There are many ear equalization techniques and while most work for many people, certain methods work better for some. The most common method for equalizing your ears when diving is the Valsalva Maneuver. A diver pinches their nose through the mask skirt and attempts a gentle exhale against their pinched nostrils. It is the most common method taught in diving, albeit being the best or safest one. The problems with this method are that it does not actually utilize the muscles that open the Eustachian tubes and it can easily be done too forcefully leading to ear damage. It is now widely accepted as a better or even safer method to attempt ear equalization by using the muscles that open the Eustachian tubes. To start practicing this method you push your jaw forward and downward as if you are about to yawn. This opens the tubes with the surrounding muscles and can be practiced out of water. After a while you can keep your Eustachian tubes open for the entire descent, without having to even use your hands for equlization. So, now that you know how to equalize your ears while scuba diving, there is no need to worry prior to taking your diving course. Best thing is you can start practicing right now! I bet you are looking a little silly right now moving your jaw around in a weird fashion in front of your laptop! If you are still worried when you start your diving course, let your instructor know. A slow descent makes it easier for you to equalizing on your first dive!